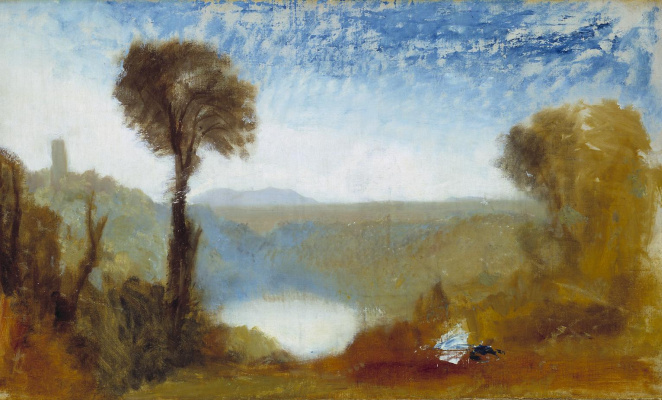 Landscape", Ehrenbreitstein", written in 1835, belongs to the later period, which is widely recognized as the flourishing creativity of William Turner. 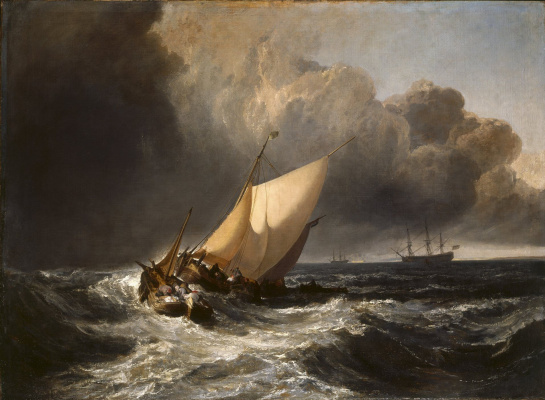 Most of the works of those years are now included in the collections of the largest museums in the world, and only six works of this importance and quality remains in private collections. The painting depicts the castle of Ehrenbreitstein (or Ehrenbreitstein) is a ruined castle near the city of Koblenz in Western Germany. 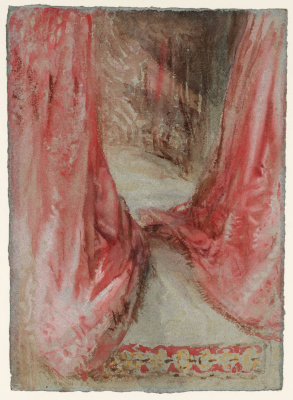 During his third visit to the country, Turner made numerous sketches and watercolors of German types, but this place had special significance for him. 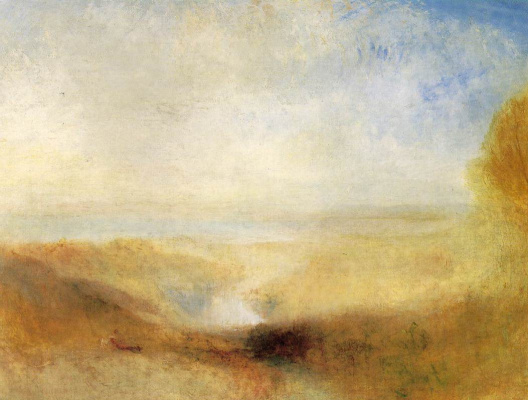 The landscape brings together two of the most romantic authors of the nineteenth century – William Turner and Lord Byron, as connected with the passage in the last poem "Pilgrimage Childe-Harold". It is the pinnacle of emotional and creative interaction with both Turner place and the issues raised in the poems of Byron, the complexities of the world after the war, human endurance and the joys of freedom. 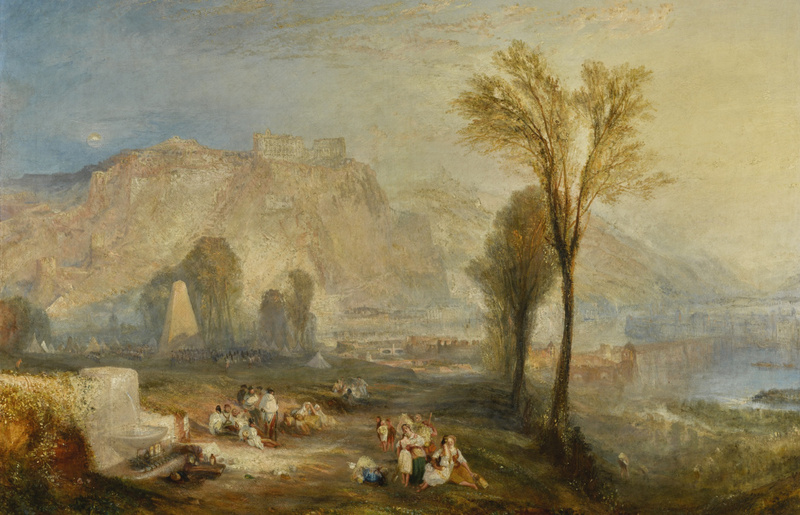 In the background, under a rock, the artist has depicted the obelisk over the grave of the French General Francois Marceau-Degrave, a member of the Revolutionary wars, in front of the locals, perched on a picnic. Originally "Ehrenbreitstein" was written for the prominent publisher John Pai, who wanted to make the engraving on this picture. 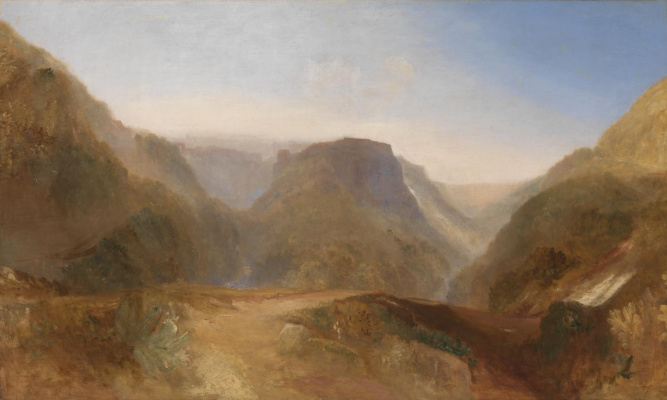 Pai suggested that Turner will write a little watercolor, but the artist was so captivated by the beauty and symbolic importance of the place that he decided to give him that vast canvas. The result – much to the displeasure of the unit – was the oil painting measuring 93 to 123 see the Translation work of this size and complexity on the plate was a daunting task, and took no less 11 years. The exhibition at the Royal Academy in 1835 "Ehrenbreitstein" received enthusiastic critical acclaim, and has since been considered one of the most famous masterpieces of the artist. 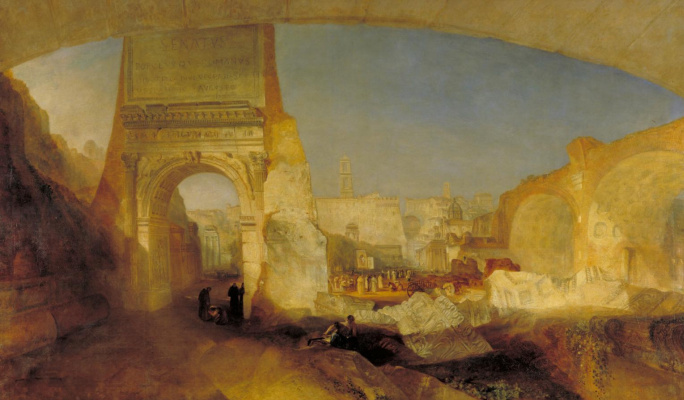 In 1844, the painting was bought directly in the workshop of the Turner, the man who later became one of his most important patrons – Elhanan Bicknell. 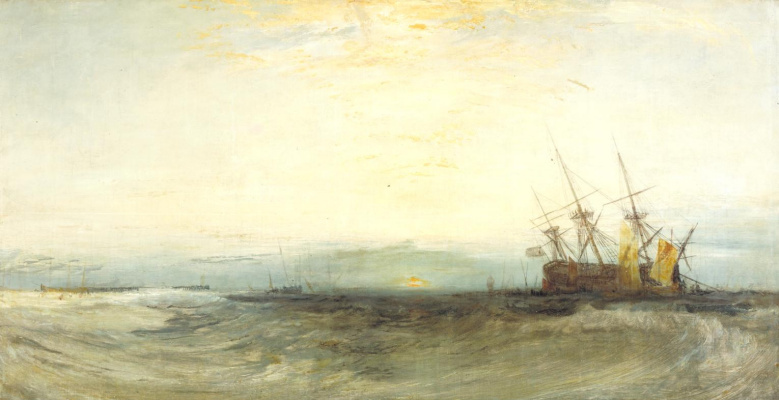 After his death in 1863, an extensive collection that included several Turner's paintings and many watercolors were sold at the big fuss and at extremely high prices. In 1965 "Ehrenbreitstein" went under the hammer for the second time. 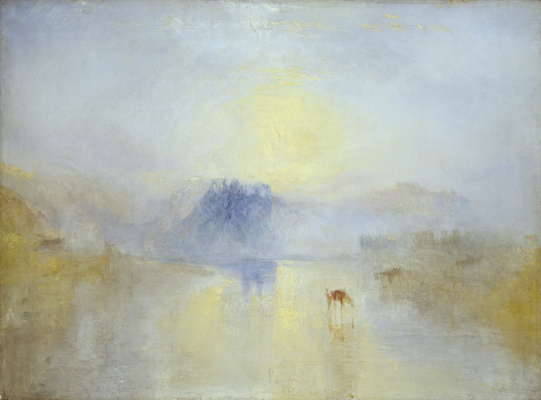 Then it paid 88 thousand pounds, which was a new world record for the works of William Turner. The third time the landscape was exhibited at vechernyuyu the sale of works by old masters auction house Sotheby's 5 July 2017 (estimate - £17-25 million or $22-32 million) and sold for £18.5 million (almost $24 million). Important works of this quality appear on the auction podium is extremely rare. 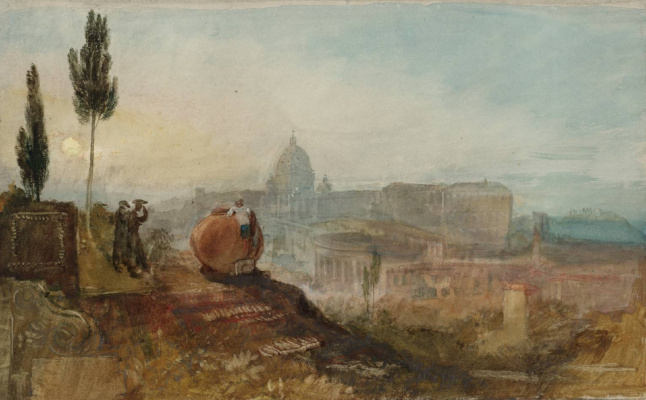 The most striking example – "View of Rome from the Aventine hill"written in the same year that "Ehrenbreitstein". In 2014, the auctioneer, Sotheby's dropped the hammer on the amount of 30.3 million pounds – the highest price for any British artist. 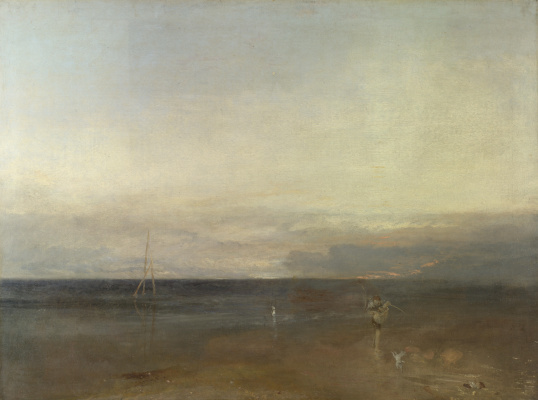 It made Turner one of the three masters compressionists period (along with Rubens and Raphael), whose work was appreciated so much.